I watched that and the old Care Bears cartoon with my sisters. But that doesn't mean I enjoyed it. And you can look up My Little Ponies on IMDB and check the episode descriptions I suppose. Only thing I can remember is that Sandy Duncan did the voice of one of the ponies. 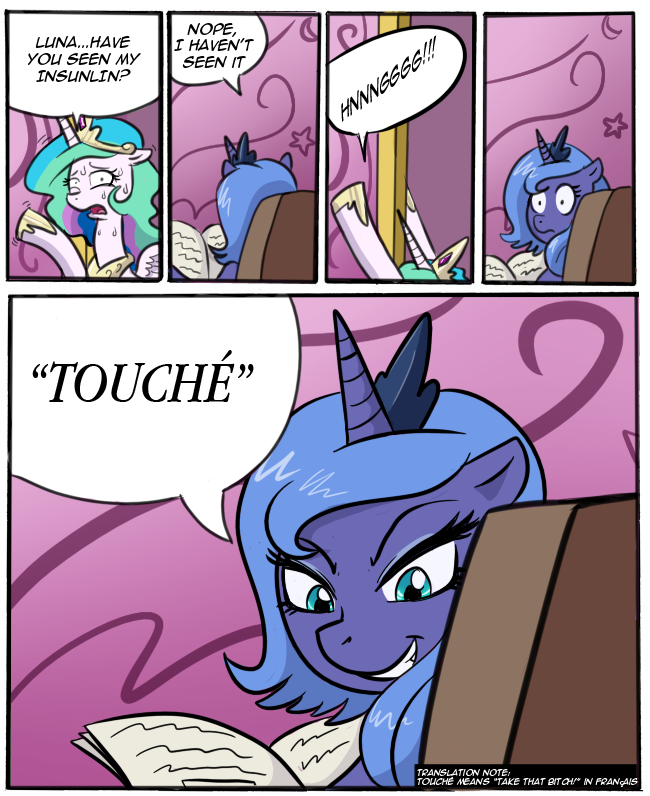 Poor Celestia. The fandom's such a jerk to her. A work-in-progress fan-made fighting-game-based-on-My-Little-Pony. Honestly, this was inevitable. As the article discusses... I would love to see a fighting game with Hasbro's full lineup, because it would settle a question I've been wondering about for ages: who would win in a fight, Snake Eyes or Uncle Pennybags? Oh man.... It is I! Turkey Volume Guessing Pony! And now I only kind of want to see Pony Servo - seeing as it'd probably be more disturbing than funny. Did you make that or did you find it somewhere on teh interwebs? Maybe the End of FlutterValley mini-series? http://www.youtube.com/watch?v=9xRP0WexZgI&feature=related. That's the 5th part of it, but it's the first one I found with the bees in it. Beyond that, personally, I love the new MLP. I normally can't handle new versions of cartoons I used to watch as a kid, but as far as I'm concerned, this is how you reboot a series.